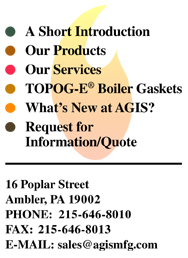 AGIS Manufacturing Company now offers a same-day shipment guarantee on TOPOG-E molded rubber boiler gaskets. The guarantee is backed by AGIS' promise to pay the standard freight bill on any TOPOG-E order that is received by 1 p.m. EST on any weekday, but isn't shipped the same day, according to AGIS President Robert Freese. TOPOG-E gaskets are high-performance replacements for traditional gaskets used in industrial and marine steam boilers, water heaters and air tanks. A line of TOPOG-E dome gaskets are commonly installed on chemical tanks used to transport chemicals by rail and truck. Molded from a special composition rubber, TOPOG-E gaskets readily withstand temperatures of up to 380° F and pressures of up to 180 PSI. Freese emphasized that there is no surcharge to customers who take advantage of the new same-day shipment guarantee. "On the contrary," he added, "it's a cost saver to our customers because TOPOG-E users won't have to maintain back-up inventory. We do it for them. 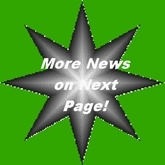 "To our knowledge," Freese continued, "this is the first time in the gasket industry that anyone has made such a guarantee. One of the reasons we're able to do this," he added, "is that we carry one of the largest inventories of TOPOG-E gaskets in the country." TOPOG-E® is a registered trademark of TOPOG-E Gasket Company.